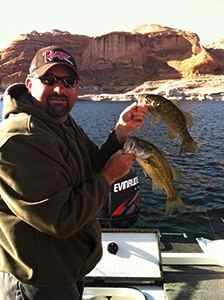 Pictured Above: Sean Pond, Denver CO, shows off some smallmouth bass caught on hula grubs in Lake Powell's San Juan arm. Bass fishing is great lake wide and will continue to excel well into October while water temperate is on the 60's. The lake level has been holding steady for the past week, which means it is still possible to launch at Antelope Point public launch ramp on the southern end of the lake. Launching is hindered by low water levels but still possible at Bullfrog, Halls, Stateline and Wahweap Main ramps. Just take a little extra time and use caution when launching at any ramp at these low levels. Look before you launch. The first day of fall brought a wind storm that stirred the lake, mixing the warm water with cooler layers below. The result was the first major temperature drop of the season. Lake surface temperature declined from 77 to 73 degrees in one day. The ideal fishing temperature in both spring and fall is the mid 60s, which will probably be reached during the first two weeks of October. The best fishing now is offered by smallmouth bass that seem to be present on all rocky points over the length of the lake. The best strategy is to move from point to point casting plastic grubs, tubes and dropshot worms. Work the plastic baits down the rocky point from the shoreline to a depth of 30 feet. Little bass are really active but bigger fish to two pounds may be found in the deeper water. Dropping surface temperature will allow bigger bass to come closer to the surface in the near future. Not to be outdone, stripers are still hungry and agreeable in deep water over the length of the lake. Graph long points, canyon mouths and steep walls where a sloping outcropping or shelf appears near a depth of 30 feet. In the southern lake these striper schools react better if chummed into activity with anchovies. In the northern lake, bait is not needed as shad are more common. Spooning from 30-60 feet where striper schools are graphed is the best technique now and huge numbers of stripers are waiting to be caught. Drop the spoon to the bottom and jig it a few times. Then 'speed reel' toward the surface to show stripers a fleeing fish. It is hard for them to resist this escape behavior. When the school is activated off the bottom speed reeling is almost a sure thing. Deep downrigger trolling is successful with shad-imitating lures at depths greater than 40 feet. Night fishing under lights is working well near the marinas. Shad are hiding in warm thermal refuges. At Deep Canyon last week the recent storms had cleared the streambed of sediment and deposited a shallow layer of sand where stream meets lake. A large school of adult threadfin shad were hiding on top of that sediment flat at the back of the canyon. Adult stripers were a few hundred yards away but separated by 30 feet of warm water. That horizontal and vertical distance is too much for adult stripers to handle. As water cools these shad thermal refuges in the canyons will become smaller presenting feeding opportunities for stripers and bass. 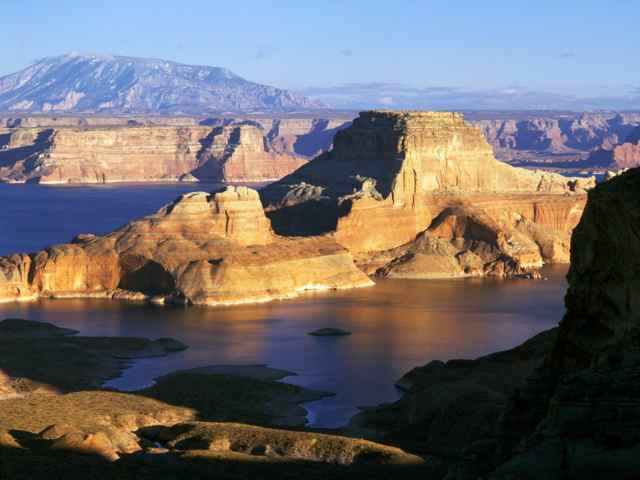 Fishing action will increase at the back of canyons as water temperature continues to decline in coming days. For the coming week most fishing success will be on main channel points and cliff walls where bass and stripers have spend most of the summer.